The next time you ask Siri what she is wearing, you can do so in the knowledge that it’ll at least be coloured green, thanks to Apple’s environmental efforts. 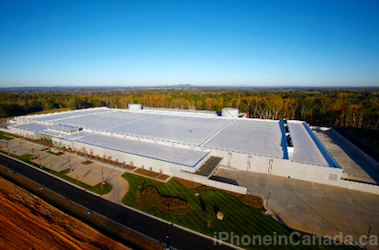 Apple is building the nation’s largest end user–owned, on site solar array on the land surrounding the data center. When completed, this 100-acre, 20-megawatt facility will supply 42 million kWh of clean, renewable energy annually. Apple is building a fuel cell installation that, when online later in 2012, will be the largest non-utility fuel cell installation operating anywhere in the country. This 5-megawatt facility, located directly adjacent to the data center, will be powered by 100 percent biogas, and provide more than 40 million kWh of 24×7 baseload renewable energy annually. To put those numbers into perspective, with both of their green power stations up and running, Apple will be providing enough renewable power to cover roughly 1/6 of their total electricity consumption WORLDWIDE. Apple states that across their worldwide facilities in 2011, total electricity consumption was 493 million kWh. This is a phenomenal feat for such a big company and it is incredibly reassuring that Apple is so conscious of their impact on the environment. If all companies could follow their lead, we would be in a much better situation globally. A chilled water storage system to improve chiller efficiency by transferring 10,400 kWh of electricity consumption from peak to off-peak hours each day. Use of “free” outside air cooling through a waterside economizer operation during night and cool-weather hours, which, along with water storage, allows the chillers to be turned off more than 75 percent of the time. Extreme precision in managing cooling distribution for cold-air containment pods, with variable-speed fans controlled to exactly match air flow to server requirements from moment to moment. Power distributed at higher voltages, which increases efficiency by reducing power loss. White cool-roof design to provide maximum solar reflectivity. Construction processes that utilized 14 percent recycled materials, diverted 93 percent of construction waste from landfills, and sourced 41 percent of purchased materials within 500 miles of the site. The full report can he seen here. It makes for an impressive read that highlights yet another reason why Apple is a global leader.